(Newser) – Doctors at a hospital in Kenya were two hours into brain surgery to remove a patient's blood clot when they discovered to their shock there was no clot, the Daily Nation reports. They had the wrong patient. According to the BBC, the patient they were operating on simply needed non-invasive treatment for swelling. 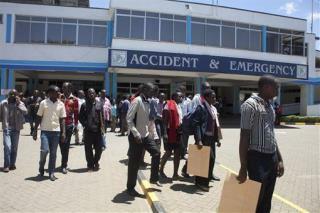 Both patients were brought into the Kenyatta National Hospital in Nairobi unconscious last Sunday. Reports blame the patients' identification tags being switched around for the mix-up. Hospital CEO Lily Koros says the hospital "deeply regrets this event and has done all it can to ensure the safety and well-being of the patient in question." Kenya is replacing Thailand as the go to spot for pedophiles. COME ON GUYS!!! ITS NOT BRAIN SURGERY!!! oh... it is? ok.. NVM. The doctors were so elated that they actually found a person in the country with a brain that they jumped the gun.